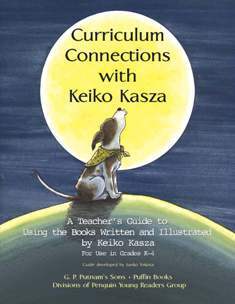 Dr. Junko Yokota, a professor of Reading and Language at the national College of Education of National-Louis University, wrote Curriculum Connections with Keiko Kasza. This describes how to use Keiko’s books in classrooms. Please click here to find out how you can use her books into your curriculum. "I use Don't Laugh, Joe at the beginning of the school year, with my First Graders, to teach them how to do lockdown drills. Safety is a very scary subject for young children and this book makes it less scary for all of them. They love the laughing and giggling parts of the book and can recognize themselves as we read it. After reading the book and talking about the characters, I ask the children why Mother Possum wanted Joe to learn how to play "dead". There is generally lots of discussion about friends and laughing and then the talk usually turns to safety. Children recognize that Mother Possum wants Little Joe Possum to know what to do to keep safe. For a possum, safety means playing "dead". It is then that we talk about safety in the school building and lockdown drills. It doesn't take long for First Graders to understand that they need to be little possums during the lockdown drill. I have had many successes with explaining , talking about and practicing lockdowns by using this wonderful book. Of course, we always have successful drills because they know how to be "little Joe Possums"! I know that the original intent and theme of this book was not to teach children how to act during a lockdown drill, but it surely lessens the tension and anxiety about it. If you have used any of her books in the classroom successfully, please feel free to email Keiko and tell her about it. With your permission, your ideas may be listed here for everyone to share.